The Athens Orthopedic Clinic selected SPG for design and engineering services at their state-of-the-art imaging center in Athens. The project has created an entry experience for guests by providing parking, bike racks, and rain gardens. In collaboration with Saint Udio, SPG designed custom bike racks and a custom privacy fence with an integrated framework for the project. 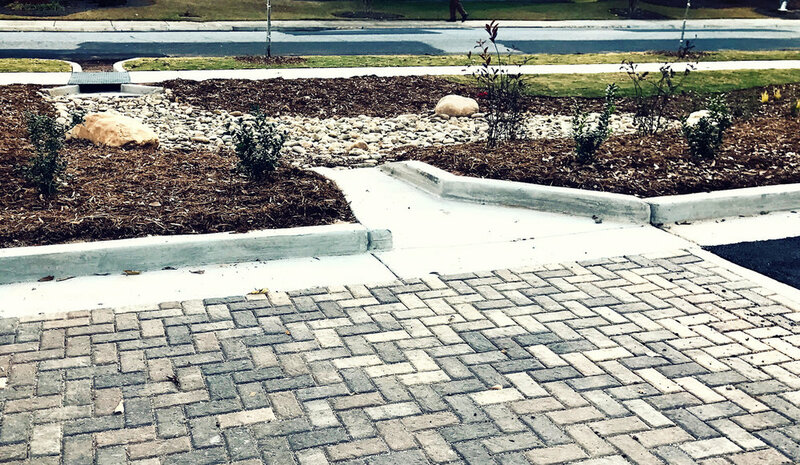 The stormwater design includes pervious pavers to detain, infiltrate, and evaporate stormwater runoff naturally. The pavers are situated around a concrete flume, which conveys runoff into a pair of rain garden cells. The rain gardens feature dry stream beds to stabilize the flow route. These beds are enclosed by vegetation capable of withstanding periodic inundation. The rain gardens are designed to hold a shallow pool of water, which then infiltrates into the engineered soil media. For larger storms, bypass flumes flow beneath the sidewalk and direct flow into the storm gutter along Old West Broad. The site included very little elevation change and limited area for treatment. The volumes and elevations were modeled and engineered to handle both small and larger storms. Highlander Design + build provided contracting services on the project.